Army Spc. 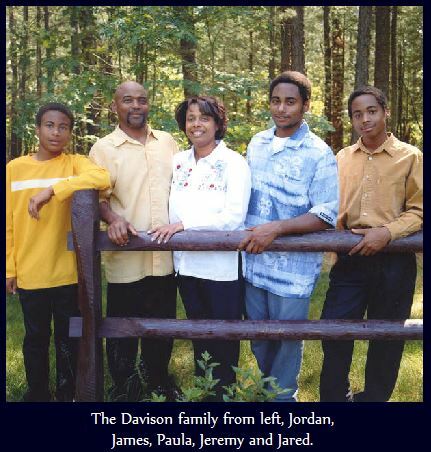 Jared A. Davison - Run for the Fallen New Hampshire, Inc.
Jared was born on February 20, 1988 in Boston, Massachusetts, the second of the three children of Paula and James Davison. He was a 2006 graduate of Milford High School. 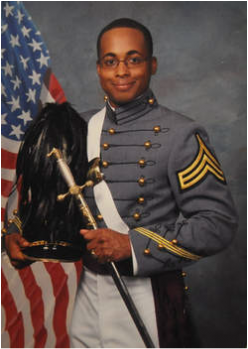 He attended Norwich Academy in Vermont, and the U.S. Military Academy at West Point, NY. He joined the 558th Transportation Company in August of 2012, where he served as a watercraft engineer. The Davisons talk about Jared with sorrow, pride and humor, remembering a boy who, father James said, “lived his life as if he knew he had a short time to live it.” James also served in the Army, says he is at peace with that. “He died serving his country. He died doing what he wanted to do.” ared is remembered by his parents as being a very considerate and kind son, brother and friend. “He had an infectious smile,” father James said. “He could break you down with that smile.” As a boy, Jared “introduced” the tradition of hugging into his family, James recalled. “I come from a kind of regimented family,” said James, who is a retired Boston firefighter. “He really taught us how to love in a different way." Jared was such a voracious reader that Wadleigh Memorial Library in downtown Milford became his second home. He eventually worked there part time. His appetite for reading ranged from C.S. Lewis to Tom Clancy. Jared was such a voracious reader that one of his elementary school teachers told his parents he was reading too much in class. His parents remember their son as a compassionate person who was always focused on his goals. “When he was in the second or third grade,” said Paula, his teacher cut her finger and Jared tried to make sure she was OK. “She was surprised someone so young would keep checking on her. He was very compassionate, yet somewhat of a leader. He knew what he wanted,” his mother said. Always more of a scholar than an athlete, Jared started doing 50 pushups each morning to prepare for high school where he played lacrosse and ran cross country. When he was about 15 years old Jared heard about the People to People program and decided he would travel to Australia with the youth ambassadors. He raised the required funds and went. In school, Jared was solid student. He was a youth leader in his church, and during the summer he worked as a counselor at Camp Lawroweld in Maine. At 16, Jared was inspired to join the Army after a family trip to Sequoia National Park where he discovered that one of the park’s first superintendents was Capt. Charles Young, a black cavalry officer and 1884 graduate of West Point. 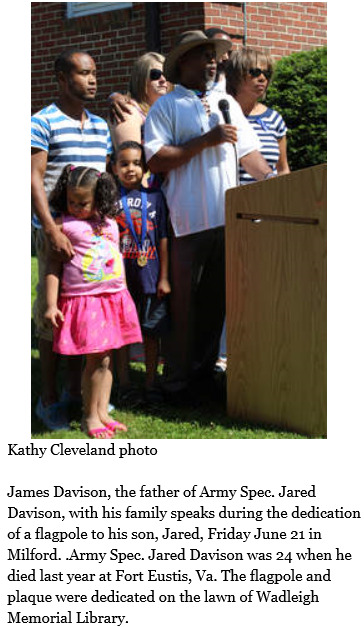 “By coincidence there was an African-American celebration the weekend we were there,” James said. “The program was about this officer who oversaw the park, how he was one of the first black graduates of the Academy and how he helped develop the park. We’ve always kept Jared’s copy of it." He was the most loyal friend I ever had,” said Brian Carl Story, who attended West Point with Jared for three years. “He always had my back.” Story said Jared never stopped talking about his brothers, Jeremy and Jordan. Story remembers Jared looked up to his brothers so much and loved his family. Pastor Dedrick Blue, Jared’s cousin, said the young man was loyal to his friends, almost to a fault. “He lay down to serve as a bridge to bring diverse cultures together. He had a smile born of true compassion and genuine love. And he had the most penetrating eyes that beamed intelligence and demanded his own truth,” said Blue. Jared's military awards and decorations include the Army Achievement Medal, National Defense Service Medal, Global War on Terrorism Service Medal and Army Service Ribbon. He was buried with full military honors in the state Veterans Cemetery in Boscawen. Jared is survived by his parents, James and Paula Davison; his brothers, Jeremy Davison and his wife, Amanda, and Jordan Davison; his paternal grandparents, Lesley B. and Lillie Mae Davison and maternal grandparents, Curtis and Yvonne Wrenn; his nephew, Darius Davison; his niece, Mariah Davison; and a host of aunts, uncles, cousins, and other relatives; his church family and friends.